Hiring trends in India is relatively strong than other markets around the world as nearly half of employers believe the recruitment volume this year is up from 2011, a survey says. According to the LinkedIn Recruiting Trends survey with over 3,000 professionals/recruiters from the HR/Talent Acquisition department, of which 255 were from India, hiring in India remains healthy, despite global macroeconomic trends. “Over 50 per cent say hiring volume is up from 2011; another 22 per cent say hiring are at same rate,” the survey said adding that budgets appear to be trending in line with hiring volume growth. Meanwhile, though India appears ahead of most other countries, there is still room to improve data-driven decision-making, the LinkedIn survey said as almost 40 per cent say they are average or poor at using data to make hiring decisions. About 81 per cent of respondents agree to the fact that employer brand has a significant impact on ability to hire great talent. A whopping 90 per cent of respondents said they are either increasing or maintaining employer brand investment. India is ahead of the curve when it comes to regularly measuring employer brand. Around 50 per cent of all India-based corporate recruiting leaders measure their employer brand as against the global average of 33 per cent. Meanwhile, the two biggest obstacles to hiring top talent include competition and compensation. Respondents are worried that their competitors will invest in employer branding, improve referral programmes, and invest in new recruiting tools, the survey noted. Around 45 per cent cite quality of hire as most critical metric. The survey findings noted that internet job boards and social platforms including online professional networks are rising as quality sources to attract talent. Another leading trend in India is that most recruiters believe in the importance of passive (who are currently not actively seeking a new job) and in the pipeline talent (database of qualified, relevant candidates in anticipation of future hiring needs). As per the survey, about 65 per cent of recruiters focus on passive talent and about 87 per cent of the recruiters are engaged in pipeline talent, the survey said. Insurance companies may now be able to acquire up to 15% stake in a single corporate house. The board of the insurance regulator, Insurance Regulatory and Development Authority (Irda), which met recently, has cleared a proposal to increase the investment limit currently capped at 10%. The move, say industry officials, will have a major impact as it will help insurance companies to take a wider exposure to large corporate groups. “In traditional portfolio, the new norms will help insurance companies to invest higher amounts in some well- managed large groups helping insurance companies improve investment performance,” said Abhijit Gulanikar, chief investment officer, SBI Life. This will give insurance companies better investment opportunities and improve yields on investments. Traditional portfolio of life insurance has been growing in the last two years, contributing 70-80% of the new sales. State-run Life Insurance Corporation alone manages assets worth Rs 10 lakh crore in traditional portfolio, which essentially comprises plain term policies, money back policies and endowment plans. It has an investment corpus of about Rs. 3 lakh crore under the unit-linked scheme. Large private sector insurance companies manage around Rs. 20,000 crore under traditional plans. Some insurance companies have touched the non-promoter group company exposure limit of 10% in corporate houses such as the Tatas. The board of the regulator has also approved a proposal to restrict insurance companies from investing more than 5% of the fund size in their promoter companies. At present, rules allow them to invest up to 12.5% in promoter companies. “As a matter of good governance, they (insurance companies) can’t invest more than 5% in promoter companies,” said a senior regulatory official. After four years, the insurance regulator is planning to revamp investment rules. In a bid to encourage investments in infrastructure, the regulator has relaxed rules by allowing insurance companies to invest in special purpose vehicles (SPVs) floated by infra companies. “They can fund up to 20% of the project cost provided the parent company gives a guarantee,” the official said. But the regulator has proposed certain prudential limits to lower risks: to attract investment, a listed company promoting the SPV must have a minimum net worth Rs 250 crore, while the floor for unlisted firms has been pegged at Rs 500 crore. The regulator has also relaxed rules on debt investments by including government securities (G-secs) within the ambit of mandatory requirement of 75% in triple-A instruments. Currently, government bonds are excluded from this basket. Industry officials say this is likely to create a 12.5-13% headroom for additional investments. Although the board of the regulator has cleared these new investment limits, the rules will be notified after consultation with the life council. Last month, CEAT turned a business initiative into an opportunity to engage with young talent. Executives at this RPG Group company invited Bschool students to suggest innovative marketing strategies to help win new and younger customers. This is part of a competition called ‘Blizzard’, where students find solutions to actual challenges the company faces. “Since we are focusing on young professionals, who better than Bschool students to input on what our marketing strategy should be or how we can connect with our consumers,” says Arvind N Agrawal, president and chief executive (corporate development and HR). The exercise helps CEAT in two ways. First, good ideas can come from anywhere, and Blizzard helps them snag more such out-ofthe-box ideas from young minds. Second, and perhaps more important, the competition also helps CEAT get ahead in the talent game, creating richer engagement at campuses and helping it screen and select candidates better. 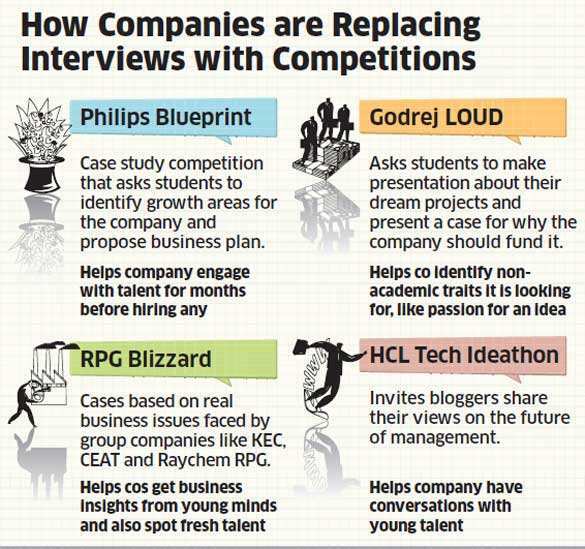 Many companies are now realising campuses interviews alone are not enough. “During placement season, we only get an hour or two with each candidate, which is too limited to gauge the student’s abilities,” says Philips vice president (HR) Yashwant Mahadik. “Competitions give us a better idea of their talent and skills, especially when they lead to months of interaction between students and managers.” Philips has launched Blueprint, a competition for students based on actual case study analyses. A whole bunch of companies are now walking this path. In August, Godrej Industries had its first LOUD – Live out your Dream event, where B-school students were asked to do a presentation on their ‘dream’ project, and vie for a Rs 1.5-lakh prize to fulfil it. Competitions benefit everyone. The winners either get a chance to intern with the company (which may lead to a job), or work closely with the senior leadership to implement the ideas they’ve suggested. At the very least, they get a chance to interact with the top leadership, perhaps even the CEO. As for the companies, they get access to new, innovative ideas; and a rare (possibly prolonged) chance to engage with students and get a sense of the existing talent pool. At Godrej, a jury of senior managers, led by Nisaba Godrej, president (human capital and innovation) and Sumit Mitra, executive VP (HR), recently picked seven winners for LOUD from 15 presenters. While they go straight into the company’s summer internship programme, Gurukul 2013, the runners-up also get a chance to interview for this. “A lot of our campus recruitment is based on giving youngsters case studies to solve, which shows their analytical ability,” says Godrej. An insurance company cannot be held liable to compensate a road mishap victim or if he dies, his family, if the accident takes place because of his negligence and someone else also gets injured, the Delhi high court has said. The court’s observations came while deciding an appeal by New India Insurance Co Ltd against a Motor Accident Claim Tribunal’s verdict which had asked the insurance firm to pay Rs 4.20 lakh as compensation to the family members of Deepak Jain who had received fatal injuries in an accident on February 5, 2002 near Azadpur. The victim was driving his father’s two-wheeler. Setting aside the lower court verdict, Justice Mittal said the FIR admits that the victim too was driving rashly and his scooter hit a woman where he received fatal injuries. The woman survived and escaped with minor wounds in the accident. The Insurance Regulatory and Development Authority (IRDA) has asked health insurance companies to indicate premium to be paid by the policyholder in the first five years while filing new products for its approval. However, the companies are free to increase the renewal premium based on medical inflation, cost of healthcare and its underwriting practice, say insurance industry sources. “The health insurer can increase the premium every year at the time of renewal, but these hikes cannot exceed the amount mentioned in the premium chart,” said JF Jawadwala, executive director, Nandi Insurance Broking and Risk Management Services. “There is no formal, written communication from the IRDA regarding raising renewal premiums. However, the regulator is advising companies to furnish a five-year renewal premium chart while filing new products, which spells out the quantum of premium hikes policyholders will see during the period.” “Even for the older products, the IRDA expects the insurers to hold the premiums for at least two to three years. Whenever the insurer wants to increase the premium of the product the company has to approach the IRDA and given a written explanation for the increase in premium of a particular group/product,” added Antony Jacob, chief executive officer, Apollo Munich Health Insurance. IRDA chief J Hari Narayan had publicly criticised insurance companies in the past for their practice of “loading” of premium on the basis of previous claims made by the policyholder. Except on some newer products, health insurers typically increase the premiums (called loading in insurance parlance) on renewal if the policyholder has made a claim in the previous year. “We have seen that if a party makes a claim in a given year, it is likely that the insurance company may increase the premium because you have made a claim. To some extent, it means they are doing underwriting at the time of the claim. And that is not the way you do underwriting. That is what we are bringing in draft regulations,” he had said, at an industry conference earlier this month. Many policyholders have in the past accused health insurance companies of hiking premiums manifold at the time of renewal without offering any explanation for the revision. “In the past, there have been instances where some insurance companies offered teaser (extremely low) premiums in the initial years to attract new customers and subsequently charged a much higher renewal premium,” said Mahavir Chopra, head, e-business, medimanage.com, a health insurance advisory firm. “As per the new recommendation by the IRDA, the renewal premiums of new health insurance products can go up only in accordance with the five year premium chart furnished upfront. It will be applicable for first five years from the date of the launch of the product. However, if an individual buys that health insurance product after two years from the date of the launch, he/she will get the benefit of knowing the subsequent premium outgo only for three years,” Chopra said. NEW DELHI: Taking a leaf out of its Japanese partner Nippon Life’s book, private sector insurer Reliance Life has begun its post-sales service drive across the country and plans to cover over 10 lakh customers by March next. Reliance Life Insurance Company (RLIC) has asked its 1.5 lakh representatives, including staff, advisors and channel partners to meet about ten per cent (over one million) of its existing customers by end of current fiscal to provide services beyond premium collection. RLIC, part of Anil Ambani-led Reliance Group’s financial services arm Reliance Capital, has begun this drive under its ‘Reliance Life Plus Club’ initiative. According to RLIC, it is the first Insurance company in India to introduce a structured post-sales customer service platform. Commenting on the new initiative, RLIC President and Executive Director Malay Ghosh said: “Our post-sales service drive is already in force and action is part of our daily business routine. We have instructed over 1200 pan-India branches to implement it like sales targets. We hope to meet one million customers by March 2013”. The initiative is inspired by ‘Zutto Motto’ (Forever More Service) service at Nippon Life, Japan’s leading insurer and Reliance Life’s strategic partner with a 26 per cent stake. “We hope to replicate the success that this model enjoys in Japan,” Ghosh said. Post-sales service is a widely prevalent practice in a host of consumer-focused businesses, including consumer goods and home appliances. It involves a continued relationship between the company and its customers through maintenance and advice-like offerings for years after the actual sale. Stressing on the need for an after-sales service, Ghosh said that life insurance is a long-term product and the customers’ needs may change over a period of time. “It is very important for sales agents to periodically visit the customers to find out their diversifying needs in their various life stages. This is the key point in enhancing customer satisfaction,” he said. “We have made it a rule that all our sales people visit every customer periodically at least once a year. Such visits also help in selling new products to the existing customers and in acquiring new clients,” Ghosh added. The company is spending about Rs 12 crore in the current financial year for this initiative to meet about 10 per cent of its customer base. At present, Reliance Life has more than nine million policyholders. Extraordinary situations demand extraordinary leadership. But once the situation is diffused, the very remarkable traits in a leader can at times lead him to his redundancy. In 1945, even after Winston Churchill successfully led Britain through World War II, displaying super leadership qualities, he lost the election. People voted for Clement Attlee although they admittedly hero-worshipped Churchill. Cut to the present: Vikram Pandit, a year after he was named CEO of Citigroup , had to fire-fight a rather unforeseen crisis situation that gripped the global financial world. Some doubted his capabilities, but after suffering deep losses, the bank under Pandit’s leadership returned to profit in 2010 after paying off the government aid which it got in a bailout in 2008. Last week Pandit resigned, much to the shock of the investor fraternity even as talks about differences with board members surfaced. He said in a statement, given the progress the bank had made in the last few years, now was the right time for someone else to take the helm at Citigroup. Whatever be the reasons behind Pandit’s ouster, management gurus believe the move re-establishes the fact that a leader who is best suited as CEO when the organization is in a particular phase of growth, may not fit the bill in another phase. That could explain why Vijay Mallya’s flamboyance , which helped him build his liquor empire, didn’t help in his foray into aviation, a business that requires high levels of economizing skills. According to Marc Effron, president of the US-based The Talent Strategy Group, boards should review on an annual basis the growth phase of the company and assess the fit of the CEO. The various stages of growth an organization typically transcends include entrepreneurial , operational, economical and revival — all of which require different capabilities from a CEO. “The board should find a CEO who can help the company win in the lifecycle stage that they’ll be in for the next three-five years — a CEO who ‘fits’ . For example, in the US, IBM had two smart, capable internal executives in the running for the CEO post — Michael E Daniels and Virginia Rometty. Daniels had a deeper history in operations and with efficiency-focused businesses like outsourcing. Rometty had more experience with sales. The organization’s strategic focus over the next five years will be continued growth through new products and services more than trying to win through being the most efficient provider of services. That suggests that Rometty would be a better choice, and she did get that job,” said Effron . Even at Apple, which is moving into a phase where operational efficiency is nearly as important as innovation, selecting Tim Cook over a marketer or design expert reflects an appropriate choice based on where Apple is in its life cycle. Pandit’s ouster also underscores that CEO tenures are indeed becoming shorter. “These days, the CEO’s tenure in the US — on an average — is slightly less than four years. He (Pandit ) has survived over four years and, in the movie called ‘Too Big To Fail’ starring William Hurt as Hank Paulson, it is clear Vikram did a great role in a crisis in 2008. And now in 2012 he is out. It is important every CEO should have a golden (may be platinum) parachute and you will need that in for years time,” said Bala Balachandran, J L Kellogg Distinguished Professor of Accounting and Information Management, North-western University. Overarching philosophy, according to Santrupt Misra, CEO, group HR director, Aditya Birla Group, needs to be clearly communicated by the board to the CEO. Winston Churchill lost the 1945 UK elections after he brilliantly steered a beleaguered nation through World War II Vikram Pandit’s shock resignation last week was after his successfully led Citigroup during the 2008 crisis, returning it to profit in 2010 Mgmt gurus maintain a CEO who fits a co’s needs during a particular phase of growth may not suit it in another phase That’s probably why Vijay Mallya’s flamboyance with liquor biz didn’t keep his airline aloft for long, say experts.